All rights reserved. 2009 copyright. I celebrated 20 years of Living on Maui, by writing some songs, with lyrics and music, that came from my love of this very special place where I live. Some are about the absolute beauty of this island. Every afternoon I walk up in Iao Valley and I'm always so moved from the energy of the AINA. But what also is so important is the Power of the Spirit of ALOHA. Mark Ellman has a site practicealoha.org and he asked me write something for it. I came up with a poem which then evolved into the music and lyrics for Practicing Aloha. Then I ran into Fulton Tashombe and he offered to help me take the single notes and then he added the beautiful arrangements and instrumentation. Keli'i Kaneali'i added his fabulous voice to make the magic happen! Furthermore, when Mark Ellman heard it he offered to pay for a music video, so I called my dear friend Bob Stone and gave him a couple of shots and he created a wonderful music video. 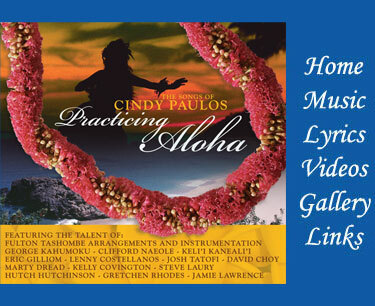 We just added it to Radio Imua at 107.5, Mahalo Kila! Now we're working on remixing some songs I wrote that George Kahumoku came in to sing. Eric Gilliom did a few songs And there is still more to come. This has truly been a blessed project.